Misunderstood Credit is a company that helps people find those loans which suit their profile and budget, regardless of their credit history. Instead of taking into account a person’s credit score which judges his ability to pay in the future based on how he has paid in the past, the company follows a different approach for finding a loan for him. It looks into the current situation of a person, his/her ability to pay and his stability in his job and home for finding a suitable loan for him/her. Bad credit describes a person’s record of past failures to keep up with the payments on his/her credit agreements. This results in their inability to get approved for a new credit. It means they have not paid their credit and other obligations in a timely manner or they have not paid them at all. Their credit report also takes into account public records like bankruptcies, state or federal tax liens or legal judgments against them. If a borrower has a bad credit, lenders consider them a high credit risk. So they are reluctant to give them a new credit. Companies pull credit from credit bureaus, which are companies that collect people’s credit history and compile it into a credit report. They are also called credit reporting agencies. Each agency maintains its own separate report and an individual’s credit history and scores may vary among them, because of the errors or omitted information. The three biggest credit bureaus are Equifax, Experian & TransUnion. you can visit their sites to get insight on your current credit score. Business owners, contract employees, affiliate marketers and other non-typical employees who do not earn a salary, but are well compensated earn a regular or steady income fall into the category of non-typical employees. Typically, credit bureaus look at this Non-Typical employment as “Risky” even if you have a steady income and have been a reliable debtor. Unlike credit bureaus, we like to run our own credit assignment, by looking at your stability and getting to know you. 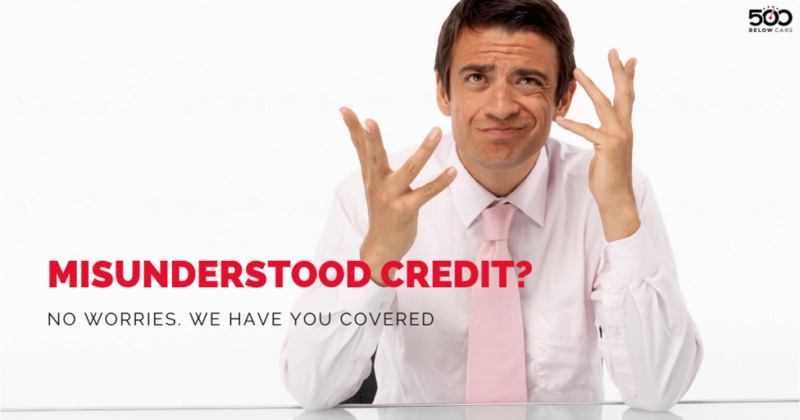 We understand that a person does not always have bad credit, but rather it is misunderstood. Here are misunderstoodcredit.com we don’t look at your Non-Typical Employment as a determent or too “Risky”, rather we admire you for betting on yourself putting in the hours and hard work to succeed. How can you improve your bad credit score? There is no quick way for you for fixing your credit overnight. In fact, quick fix strategies for improving credit can create more trouble for you. So you should avoid these strategies. Here are some ways following which you can improve your bad credit score over time. You first need to get a credit report from a reporting agency. After obtaining it, you should check it thoroughly to ensure it is accurate. Also, make sure that you date and document any disputes you raise. Then date and document them again. If the agency cannot or does not verify your disputes as accurate through a creditor, then as per law it must be removed from your report. They are under the obligation to investigate your discrepancy within 30 days of the date of your letter. You need to clean up your accounts. Close any newer accounts which are not completely necessary and make sure they reach the ‘closed by consumer’ status on reports. Retain your older accounts even if the credit history is bad. It is better to have a bad credit history than having no history. You are trying to address your credit score, so this will become fine later. Ask some of your smaller creditors like entertainment cards, travel creditors and credit unions to forward your account information to the credit agencies. All of them may not do this, but some of them will forward this information to the agencies and this can be an extremely useful way for you to improve your bad credit rating. Have a rigid budget and debt payment system and follow it. Sometimes you fall in to the trap of avoiding communication from your creditors. This is a bad idea, they will not go away. Rather this would be written off as ‘bad debit’ and further damage your rating – so set up a payment scheme with the company dealing with the debt. Very often payments can be decreased and made flexible, they would rather make it affordable for you to pay them less as opposed to you paying them nothing. You can follow all these above stated steps suggested by Misunderstood Credit as these will help to improve your bad credit score over time. Now it is time to know about no credit. People who are young or those who are new to the USA do not have a credit history to get credit. So they cannot get a credit without a credit history. It puts them at a disadvantage and they are unable to get a loan for meeting their various financial needs. There are a huge number of American people who have no credit history. Lack of it can have a profound impact on their lives. In a typical loan situation, lenders run a hard inquiry on the credit of loan seekers. This enables them to determine the credit history of loan seekers as well as know their credit score. But in the case of young people or people new to the USA, they do not have any credit history or credit score, so lenders are unable to determine the history or score. So they are reluctant to give them loans. This makes it difficult for them to get loans for meeting their various financial needs. Young people or people new to USA not getting loans due to no credit history, seems a flawed system to Misunderstood Credit. So the company does not consider their credit history or credit score for finding a loan for them. It just looks into their current situation and particularly their ability to pay and their stability in their job and home for finding the right loan for them. There are a number of ways with which these people can build their credit history. One of them is to obtain a secured credit card. A credit score is not necessary for it. By using the card to draw on the money they deposit with a bank will help them build a credit history. Becoming an authorized user on someone else’s car is another option for them. College students can do this with their parent’s card. If you happen to be a young student or someone who has recently arrived in USA with no credit history or a non-typical employee with a bad credit history, you need not worry about not getting a loan. Misunderstood Credit can help you find the ideal loan for you. The company does not consider your credit score for finding a suitable loan for you. Instead, it will consider your current situation and specifically your ability to pay and your stability in your job and home. Knowing that your financial needs will likely be covered will bring you relief and peace of mind. Thus, you can start planning for a better financial future and life from today itself.